Horiyoshi the Third’s interest in tattoo art began when he was 11 years old. He said he received a great shock when he saw a tattooed man at the public bath. Later, as a high school student he saw a book at the library, which was a collection of hundred poems and had many illustrations and engravings of tattooed men. He said that was the beginning of his passion for tattoos. It is much later that he began considering tattooing his own body. He said he used his body for many experiments before he found the most relevant technique. At high school, he wanted to do something that no one had done before. He cut his skin with a cutter and tried to insert ink inside his body. That was his first experience. 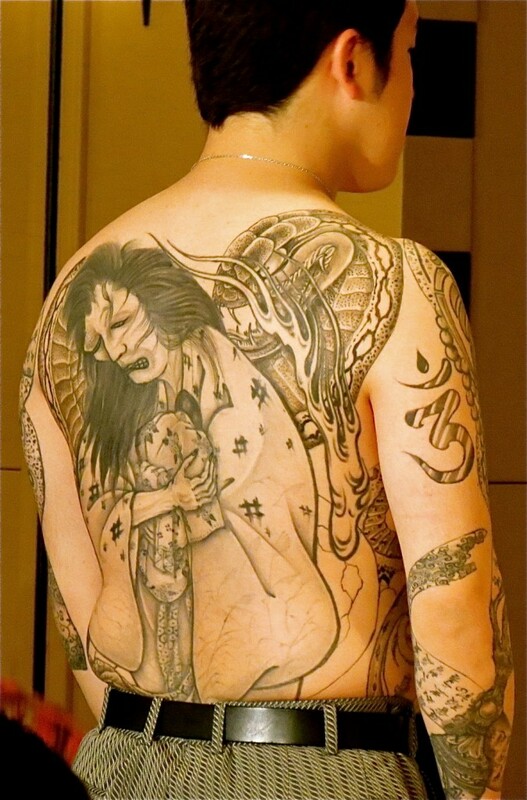 He got his first tattoo at age 22, by Horiyoshi the Second, on his entire back. At the time, while constantly thinking about inventing new techniques, he used to tattoo clients on his own. But because he wanted and needed to learn more about the art itself, he became the pupil of Horiyoshi the Second at age 25. Horiyoshi the Third explained that anyone could wear a tattoo underneath their clothes: “People’s clothing are the ‘social symbols’ which allows other people to understand whether he/she is a Buddhist monk, a Christian priest, a salary man, or a medical doctor. Therefore the clothes are the symbols constructed by the community. But at the public bath, once naked, no one knows whether you are a monk, a priest, a lawyer or a musician. The tattoo is the individual’s own symbol. It is a different world. People who wear tattoos feel like they live in two different worlds. 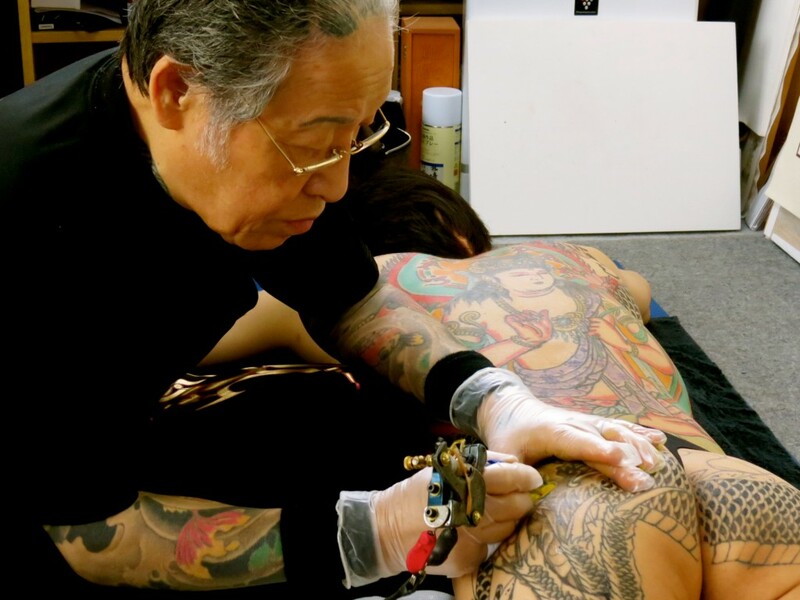 Usually, ordinary people live in the same society, whether they take off their clothes or whether they wear them.” He said during a tattoo session in his Yokohama studio. “People’s clothing are the ‘social symbols’ which allows other people to understand whether he/she is a Buddhist monk, a Christian priest, a salary man, or a medical doctor. Therefore the clothes are the symbols constructed by the community. But at the public bath, once naked, no one knows whether you are a monk, a priest, a lawyer or a musician. The tattoo is the individual’s own symbol. It is a different world. People who wear tattoos feel like they live in two different worlds. 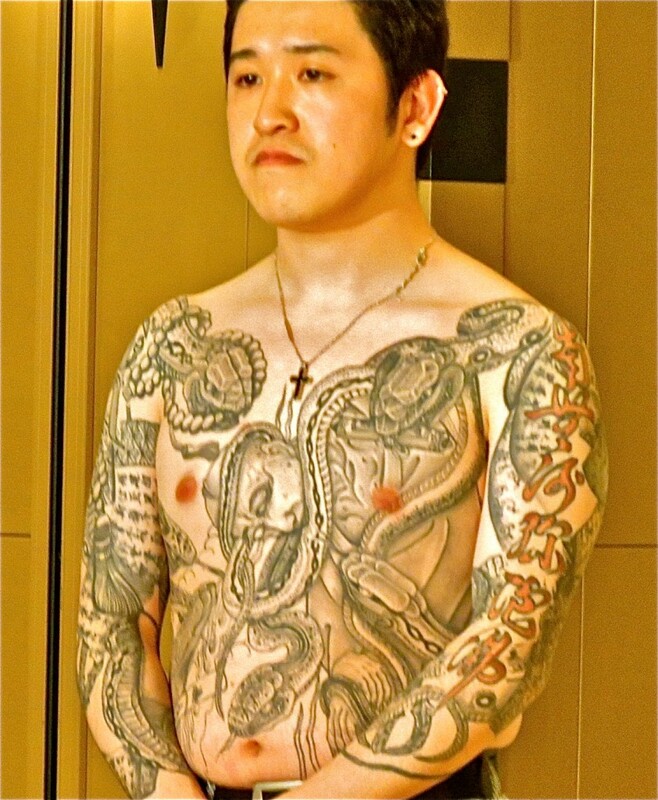 At a special event organized at the Foreign Correspondents Club of Japan (FCCJ) on May 22nd, Horiyoshi III explained that tattoos remain popular among Japan’s organized crime members, but he insisted on the fact that nowadays, a person who choose to have a work of art indelibly marked on their skin are not necessarily a gangster. How does it feel to have your skin permanently colored? People who wear a tattoo have the chance to review themselves all the time, because they can observe themselves inside and outside, in the sense that they constantly position themselves from the point of view of ‘the other’, from the point of view of a third person. Urban legend says that European aristocrats have been secretly tattooed by Japanese tattoo artists in times when tattoos were forbidden in Japan, could you give us a comment? During the Meiji period, creating tattoos and wearing them was forbidden, however the Japanese irezumi (入れ墨）were hugely popular in foreign countries. Frederique IX of Denmark (King of Denmark from 1947 to 1972) probably did not get his tattoo in Japan, in a time when it was banned by the government. Tattooing has been outlawed by three government decrees. When we see the old photos of him, we can indeed see he has a Japanese dragon, but who knows if there is a public record of his travel to Japan? There is another Horiyoshi in Azabu (Tokyo), who has no ties with us, the Horiyoshi from Yokohama. Many people get mixed up. I am a descendant of this tradition, and despite those bans, our culture has survived. There are many tales about the European aristocrats. Nikolai II from Russia is also known for having a tattoo made by a Japanese tattoo master. It is said that he had it done in Yokohama, but it is more likely that it happened in Nagasaki. Documents have come out recently about this incident. He really insisted that he wanted to have a Japanese tattoo although the Japanese government was banning tattoos for its own people. But because the request came from a nobleman, the Japanese government allowed this to happen. There are many stories like that on the record. We do not know what parts of these stories are true and what parts are not. However, one thing is sure, there was never a Horiyoshi master from Yokohama involved in these kind of stories. What does religion say about tattoos? In the Confucian society, you are not suppose to hurt your own body, otherwise it was the beginning of the unhappy life. Could you tell what you think about the mayor of Osaka and his latest crackdown on tattoos? Modern Japanese people are being mind controlled, in the sense that they ‘fear’ people who wear Japanese irezumi. Because the mass media have ranked irezumi out of the arts, the ordinary people started to recognize it as a ‘bad thing.’ For example, when a child sees a tattooed person at the swimming pool or at the public bath, his or her parents would say ‘don’t go there, don’t watch it,’ that’s why, unconsciously, people start to hate tattoos. We can say this is a sort of propaganda. We say ‘yakuza are bad’. It is true that they do bad things, but it isn’t only the yakuza who do the bad things, and people without tattoos can also be criminals. For example, during the Great Hanshin Earthquake in Kobe in 1995, those who took emergency action before the administration were the yakuza. They distributed drinking water, baby diapers and many other survival materials. The media never report on the good things they do. This can be seen as an accusation. The Japanese government takes advantage of their help only when it is advantageous, but when it doesn’t suit them, they truncate, this is the power of the state. But when you have a big crime, you can sure that all the media will be after it. So, according to me, the question is which news should be covered more intensely. I do believe that the media associate the tattooed people with the ‘bad ones.’ So, in the news, you will read ‘a tattooed person did such or such crime.’ I don’t know why, but the people who hate tattoos have a reason to discriminate people who wear them. I think it is bad from the media to report only one side of the story of these people. The obligation of the media is not to force people to believe one thing, but to give the chance to the readers to understand both sides of an issue and decide for themselves. Why do we refer Japanese tattoos to organized crime (yakuza)? I think that the Western people also have a prefabricated idea that the Japanese traditional irezumi are designed for the yakuza. Someone once told me ‘I want a yakuza-style’ tattoo. It is a common recognition of it. But it is not the yakuza’s fault if their tattoos are designated in such way. How long did it take you to tattoo your entire body? In total, it took me 12 to 13 years to get the entire tattoos on my body, including the time that I didn’t get tattooed. It is one of the good things about Japanese traditional tattoos, is that it requires time, thought and energy to realize them. In the west, people make them too quickly, without giving it deep thought, and they regret their actions. For them, it is normal to have one tattoo started and finished quickly on the same day. It is difficult to say whether the wabori Japanese traditional tattoo hurts more or less than the electric needle tattoo. Pain is like a tickle, it is not a feeling that you can measure. You can measure the weight of a person, for example, but you cannot measure pain. Some people say they are afraid of the sound of the electric needle. My clients are 90% “ordinary people”, among them salary men, musicians, bar hosts, of course I do have yakuza clients as well. However I have fewer yakuza clients than I used to have in the past. Some kumi or organized crime groups nowadays order their members to erase their tattoos with lasers, if they can afford it. How different is it to tattoo on female body? I do not really enjoy tattooing women, not that I am misogynistic. I hate to ask a woman to undress herself, but I cannot tattoo them if they are not naked. Also, the problem with women is that they tend to bring tattoo masters to court because of a missed movement. It is also very annoying to constantly try to be vigilant not to have the next client sitting in the waiting room to try and see the naked body of the female client. It is simply too time consuming and I don’t have the energy for that anymore. How long does it take to make a whole body tattoo? To estimate how long it takes for a whole body tattoo, it depends on the weight and the height of the person, however in average, it can take up to more than 200 hours. 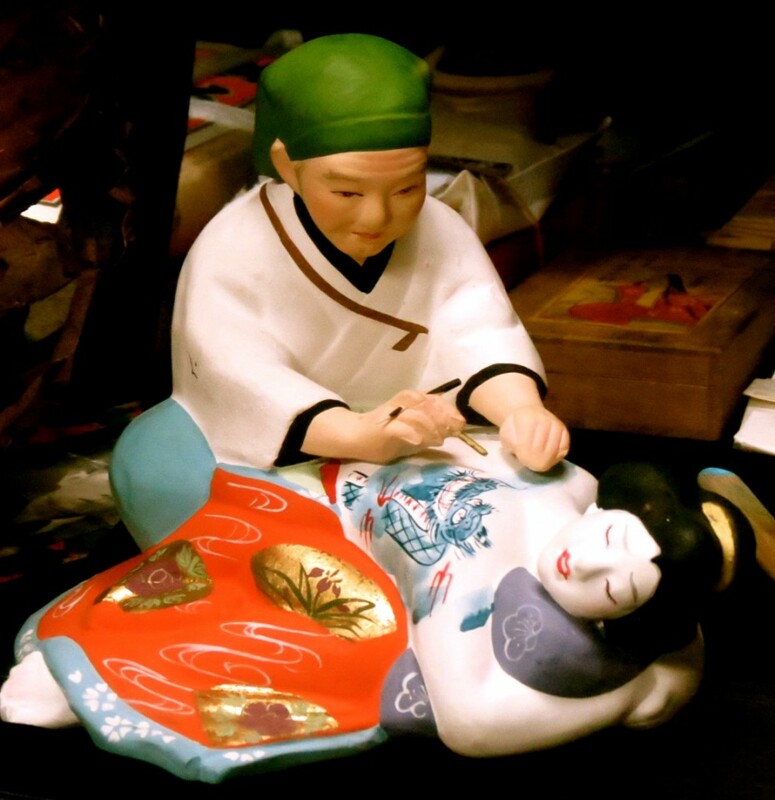 Is traditional wabori (和彫り) more painful than the modern needle? It is difficult to say whether the wabori, the Japanese traditional tattoo hurts more or less than the electric needle tattoo. Pain is like tickle, it is not a feeling that you can measure. You can measure the weight of a person, for example, but you cannot measure pain. Some people say they are afraid of the sound of the electric needle. You are a very experimental tattoo artist, what are some of the innovations you made? I was using my own technique for twenty years before I presented it to the general public. 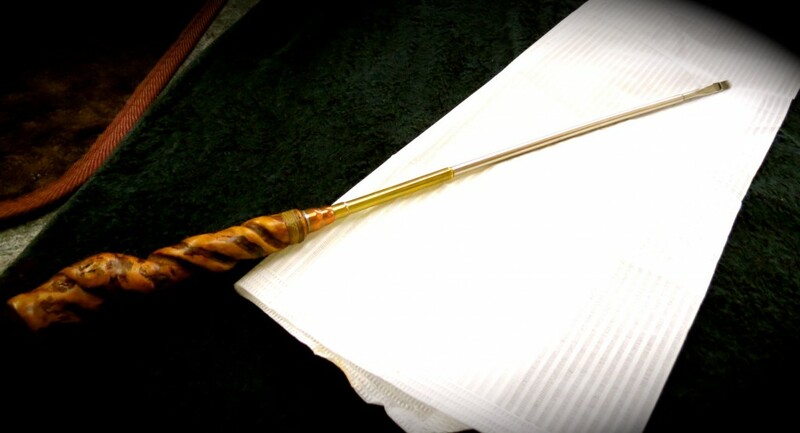 However, once it was launched, every Japanese tattoo master in the world started to use it, because it was much more hygienic than the traditional bamboo stick tool. Do you think your art will fade? I am a descendant of this tradition, and despite the government bans our culture has survived. The tattoo will never die, it will evolve. 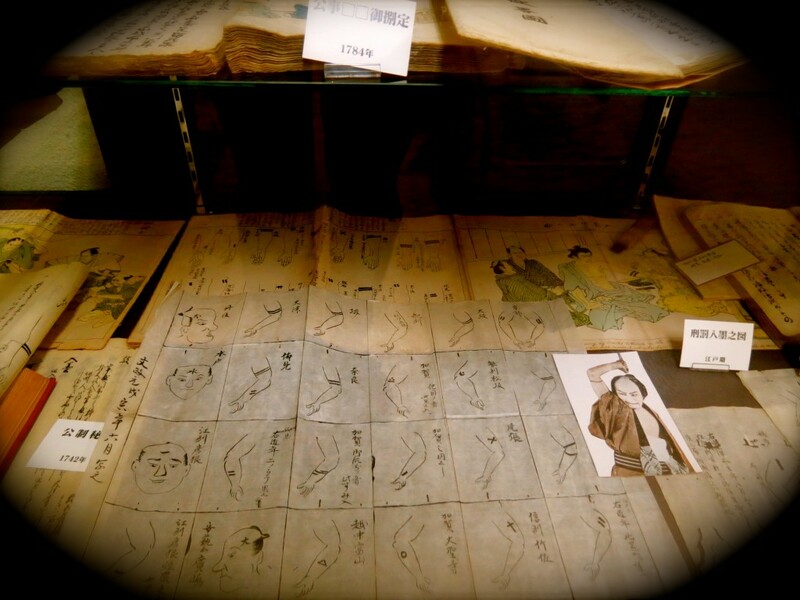 It is natural that compared to the Edo period, the tool, the designs and technologies are all in constant evolution. Therefore my art will evolve, rather than disappear, this is my belief. For example, in the past, I used to throw shochu (potato liquor) on the scars, nowadays, thanks to progress in the art, we use certified disinfection drugs. This is also an evolution of the techniques. Ten years ago, I had 10 percent of foreign clients and this year, I have maybe 40 percent of clients who are non-Japanese. The number of Japanese tattoo fans is continuously increasing over the years. Tattoos may fade over time but the art of tattooing itself will never fade way. A young man with a stunning tattoo of Kanon Bosatsu (観音菩薩）the all-seeing, all-compassionate Buddhist deity. Designed by Horiyoshi The 3rd. Tattoos are as Japanese as sushi, samurai, and yakuza but in recent years with the crackdown on organized crime (the yakuza), tattoos have become increasingly socially unacceptable while many younger Japanese and people living abroad have embraced tattoos as a fashion item. In December last year, the government of Saitama Prefecture submitted a bill to revise local ordinances to prohibit tattoos under the age of 18. A fine of up to 500,000 yen will be levied on the violators of the law. If a space is provided to tattoo on young people under 18, there is a fine of up to 300,000 yen for the tattoo parlor owners. If the law is passed it will go into effect as of February 1st, this year. Japan has waged many fruitless wars in the past and the latest war is a war on tattoos. Kicking it off was the Mayor of Osaka, the son of a yakuza boss, who as most yakuza are, was probably heavily tattooed. According to AERA magazine’s June issue (2012), at least two people in the Osaka metropolitan area have removed their tattoos after the mayor of Osaka announced the city’s crackdown on tattoos. The young and charismatic mayor of Osaka, Toru Hashimoto, who was elected in 2011, has been compared to Adolf Hitler in the Japanese media for his authoritarian governing style, showing that Godwin’s rule applies even in Japan. Although, Hashimoto does have some fascist tendencies. It’s hard to really root for a guy who rose to stardom under the tutelage of yakuza associate and lousy comedian Shimada Shinsuke, who had Hashimoto appear on his variety show about laws in Japan. Hashimoto also got his start as lawyer for consumer loan outfits, Japan’s equivalent of legal loan-sharking, which doesn’t exactly make him a champion of the downtrodden. Never mind. From May to June this year, he ordered an official survey upon the Osaka civil servants to reveal whether they wear a tattoo on a visible part of their bodies. Mr. Hashimoto, 42, announced a crack down on tattoo bearers who work in the public sector in Osaka last May. After a survey was conducted, the people of Osaka decided, that public servants should not wear tattoos, “because those who see them feel ‘awkward,’” the spokesman of the Osaka city hall explained. The mayor Osaka then requested all the public servants to indicate how big and where their tattoos were located, in an official letter. The root of this controversial crackdown on tattoos was sparked by the case of a welfare officer who intimidated children by exhibiting his tattoos. “We do not wish the tattoo to be visible to the eyes of the public, we simply would like them to hide their tattoos with clothes or band aids, if they are visible,” the spokesman said. After May 2012, the esthetic surgery clinics reported that tattoo related issues and requests from patients “to remove their tattoos” had increased by 25% and are still increasing, according to AERA. According to a medical doctor interviewed by AERA, there are three ways to clinically erase a tattoo: the laser ablation, the resection and the food technologies. It should be pointed out that this policy is not going to become a law, but simply “the ethics of work” in Osaka, and the staff will be requested not to exhibit their tattoos at work. In order to target the concerned staff, the city of Osaka sent a written request to 35,000 people. 113 replied that they had tattoos in a visible place on their bodies. According to Manami Okazaki, the author of Tattoo in Japan: Traditional and Modern Styles, who researched in depth the current situation of tattoos and those who wear them in modern Japan, “With the popularity of tattoos in America, with several reality TV shows and celebrity tattoo artists, tattoos are increasingly popular among young people in Japan.” Whereas before, more yakuza people used to wear tattoos and “the gang connotations were stronger.” However, the historical connection to the yakuza still remains overall, because the recent crack down on tattoos in Japanese society has increased more than ever, she explained. An explanation of the decline of yakuza clientele and the increase of ordinary citizen clientele given by Hokuo, a tattoo master in Japan interviewed by Manami Okazaki, is that nowadays, the yakuza do not have the money to buy extravagances such as whole body tattoos. A decade ago a full-body tattoo could take up to 500 hours to complete and cost over 5 million yen. The cooperative association of Hakone hot springs and ryokan said that the traditional Japanese irezumi (入れ墨）generate “fear and awkwardness,” generally because they are associated with members of the anti-social forces (反社会的勢力. The Hakone hot spring association spokesman said that, people wearing tattoos are now increasing and “discussions are raising everywhere in Japan, because there is no definition or explanation of the ‘fashionable tattoo’ and the traditional irezumi.” He also added that there was no clear explanation given to whether this is “good or this is bad,” but the Japanese irezumi is forbidden everywhere, in public baths, in swimming pools, etc. He said that the problem is when the tattoo creates “fear and uneasiness.” “It’s a difficult problem. It’s true that the irezumi could be seen as part of Japanese culture, and people who are not members of the yakuza are also wearing tattoos. However, in general, in Japan, tattoos are not good,” he concluded. The Asahi Newspaper in Hokkaido reported that a new initiative rose among the Hokkaido public baths owners’ union who submitted a proposal to restudy the manuals for letting tattooed customers use the facilities. The initiative, currently under consideration, was raised as some owners started to say that: “excluding tattooed people is discrimination.” According to the Asahi Shinbun, since the Hokkaido organized crime exclusionary laws went into effect in 2011, this reality has raised other sorts of trouble. 245 public bath owners have been inquired on this issue. 75% have replied to the inquiry. Currently, 75% of the public baths owners allow tattooed people to use their facilities, 19% believe that they might lose customers if they ban them, 17% answered they fear that “not letting tattooed people in might create trouble with the other customers,” and 36% answered that they have nothing to report in particular. 24% of them informed their customers about the ban on tattoos on posters or orally. 71% answered they have not announced anything in particular. Most of the public baths owners reported that their main concern was to “establish the right limits between the Japanese traditional irezumi and the fashion tattoo.” Many also reported that even though they announce the ban on posters, “it is difficult to actually refuse them entry.” The result of the survey basically announced that 60% of the poll requested that “each public bath owners should have the freedom to exercise the right to ban or allow entry to tattooed individuals based on their own judgement.” And 16% wish the rules to be changed, and are considering changing the content of the manuals. The reason given is that discriminating against tattooed people would be a violation of the human rights. The spokesman of Hokkaido’s union of public bath owners said that they did not intend to change the manuals only because of the tattoos issue. They conducted the survey because they received some complaints over the last few years. The revised manuals have been published in the summer of 2012. “Some people think that the tattoos are a nuisance. But the opinion are quite diverse, it is fifty-fifty,” the union member said. The Hokkaido Organized Crime Exclusionary Ordinance Team told JSRC that the inquiry started in November last year and that the survey does not judge whether the tattoos are “good” or “bad.” The Hokkaido organized crime exclusionary laws that went into effect in 2011 evoke the issue in a “hygienic sense,” and also from the point of view of the human rights and discrimination against tattooed people. With regard to the hygienic issue, the spokesman of the Hokkaido law enforcement unit explained the hygienic issues of tattoos, such as transmissible diseases. Tattooed customers’ “hygienic issues” were compared to customers with tuberculosis. “The reason we have to kindly ask certain customers not to use the public facilities is because we would like to have ‘healthy bathtubs’, the message is ‘let’s have clean public baths. People tend to feel awkward on the hygienic level when they bathe with tattooed people,” he added. Tom Stringer, 25, a British English teacher in Osaka for four years was refused entry to become a member of a gym spa called Costa, because he was wearing an 8 cm diameter circular tattoo on his chest. First, when he tried to apply, the staff asked him if he had any tattoos at all, he answered honestly, and he was banned from the gym. In Sapporo this year, Tom was also discriminated because of his tattoo on hischest. Inside the changing room of a spa, while he was getting ready to use the facility, he was kindly asked to put back his clothes and leave the onsen, when a female cleaning staff member came in and saw his tattoo. 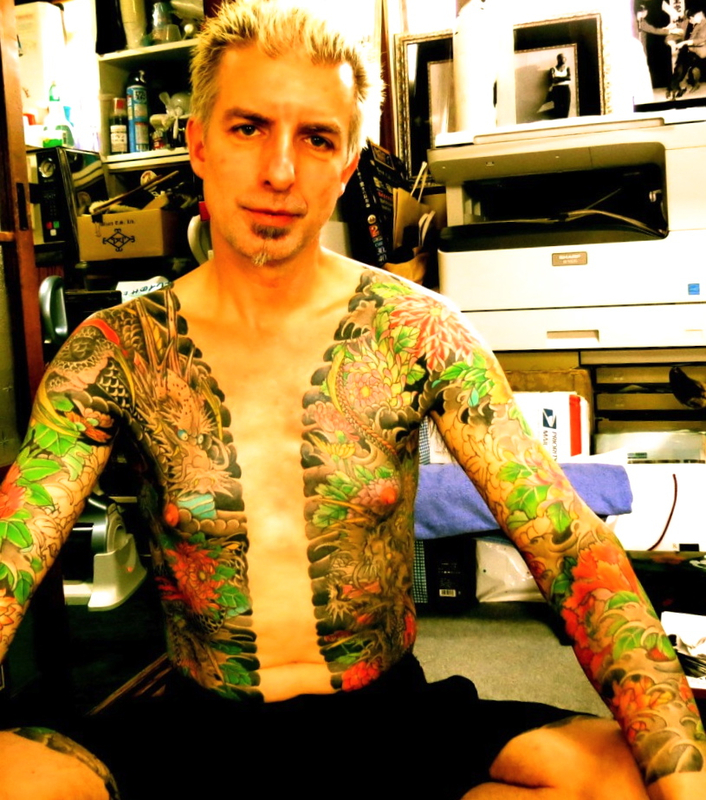 In his four years living in Japan, Tom was discriminated twice for wearing a tattoo. At the Language school in Osaka where he is currently teaching English, no one has treated him badly because of his tattoo. Foreigners or tourists are not the only victims of tattoo discrimination. The surgeon interviewed by AERA also reported the case of a young Japanese woman who was discriminated over her tattoos. One of the surgeon’s patients, a young woman in her twenties, told him that a employee of a spa kicked her out while she was washing her hair, and did not let her finish bathing. She told him she remembered crying bitterly after that experience. It is difficult to say whether the wabori Japanese traditional tattoo hurts more or less than the electric needle tattoo. Pain is like tickle, it is not a feeling that you can measure. You can measure the weight of a person, for example, but you cannot measure pain. Some people say they are afraid of the electric sound of the needle. “Ten years ago, 10 percent of my clients were foreign and this year, I have 40 percent of my clients are non-Japanese. The number of Japanese tattoo fans is continuously increasing over the years,” he added. A yakuza boss and part-time tattoo artist at work. According to this tattoo artist on his spare time, the layer of ink inside the skin helped the firefighters to endure the heat of the fire. Whether this is true or not is hard to say–there hasn’t really been a study of tattoos and fire-fighter endurance. John, 52, is a computer engineer currently based in California, who worked seven years in Japan in the past. 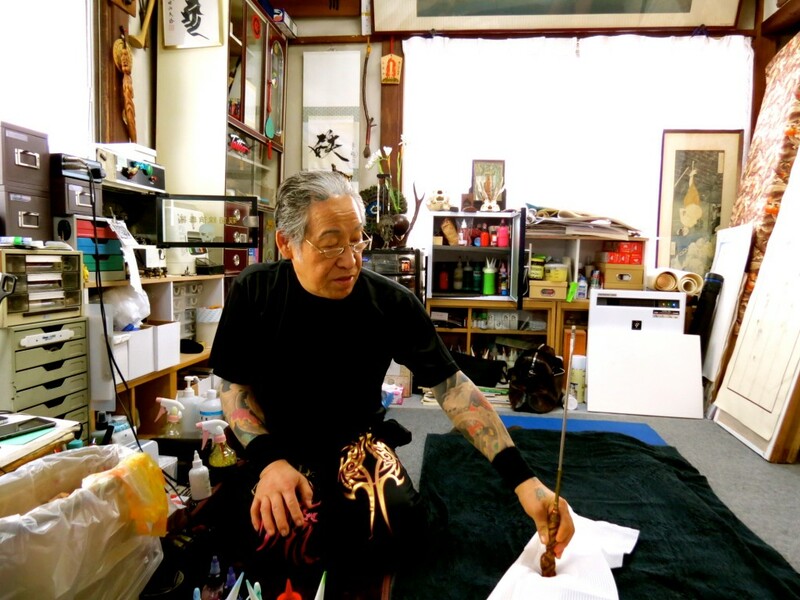 He started his whole body tattoo at age 40 with Horiyoshi the Third, in Yokohama. John travels two weeks a year to Japan to get his tattoo finished year after year by his favorite tattoo master. 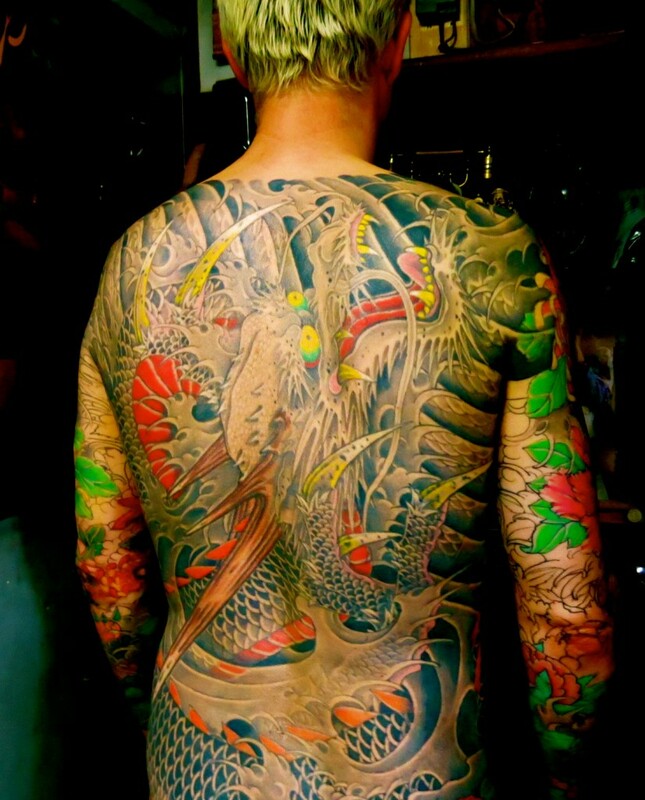 John has been tattooed by Horiyoshi III for 12 years but the tattoo is not yet complete. Mr. Kai works as a harbor blacksmith for a power generation company in Kyushu. 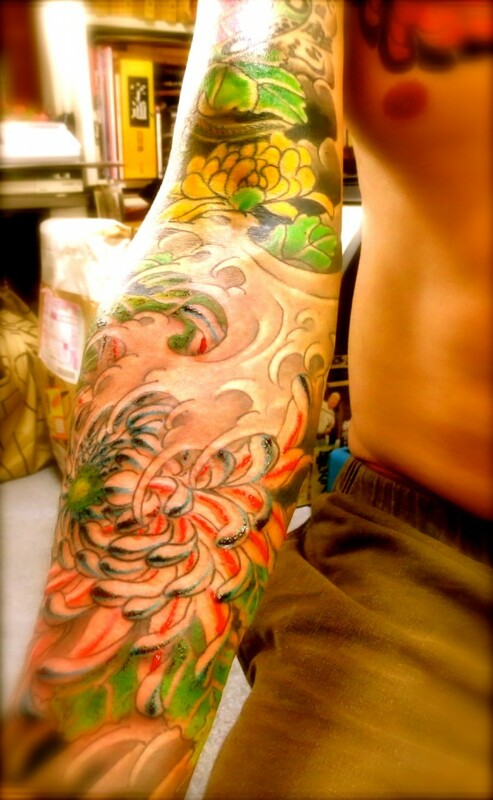 He intends to get a whole body tattoo at Horiyoshi the Third’s tattoo studio in Yokohama. He estimates that it will take him another 3 to 4 years. The traditional methods of tattooing in Japan are close to dying out and as Japanese culture adapts to tattoos, Japanese society is experiencing some growing pains. Whether those growing pains even come close to the actual pain of a traditional tattoo is best left to the imagination. *Criminal without identifying body art or physical features.